Digicam Mic Wind Guard - an *actual* bandaid! Wow. In the previous post here on Unpressable Buttons, I called a do-it-yourself design fix a "bandaid" for poor design. But here's another bandaid fix - and this one's actually a bandaid. Yup, from PopPhoto Flash, a tip for silencing the horrible blowing-wind sound that plagues so many videos shot with digital cameras is to cover the microphone with a small bit... of bandaid. Before I hit some limit that I'm sure exists for the use in a single blog post of the word "bandaid" (oops, just hit it), let's make sure there's a lesson learned here. When users come up with great workarounds, designers should be paying attention. (Any Canon folks perusing that blog, I hope?) And more than just replicating the fixes, attack the sources - are there microphones that do better in windy conditions? Can software sort out and ditch the wind noise? Or could a wind filter be automatically engaged by windy conditions - even just by being passively "blown into place" by the wind? These are the kinds of design solutions which, when done well, will be invisible to the user. No problem, no need for a... well, you know. Dave, Dave, Dave, Dave, Dave, Dave, Dave. Corporations spend gazillions of simoleons every year protecting their copyrights. One may recall the infamous "Xerox is not a verb." campaign of yore. Though, I imagine Google is happy to be a verb. When someone says, "I'm going to Google you." they actually use Google. When they say, "Let me xerox this for you." they may well be using a Canon imageClass 2300 or perhaps the RICOH Aficio MP C3500 SPF (35 ppm!). 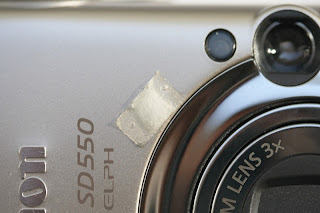 As such, when you are placing a "bandaid" over your "digicam mic" you are not merely making use of the store brand of adhesive bandage from your corner druggist (though, it is admittedly MacGyver of you). Oh no, my friend. You are actually infuriating countless copyright lawyers and other upstanding corporate functionaries down at the offices of Johnson & Johnson Consumer Companies Inc.
Prithee, the next time "wind noise" offends, place an adhesive bandage, a "BAND-AID (registered copyright)," or nothing at all, my good man. Ladies and gentlemen, my old friend Jonathan Jackson! Thanks for keeping me on the straight'n'narrow, Mr J. And for giving me an idea for a whoooole new post... Keep in touch, and "highest regards" right back atcha!